wouldn't it be great if you could confidently walk out the door every day wearing your go-to favorites, head-to-toe? i think this is really the ultimate reward of having a wardrobe that really works. i love the luxe emerson version, but after doing my budget for the season, i decided to save some money for holiday planning. enter the zara factor – their coats always appeal to me the most as worthy, relatively inexpensive alternatives to a designer splurge. still, you have to pick and choose. there are plenty of times when i've admired a chic zara coat on the rack, only to look at the fabric tag, wince at the high % of synthetic / poly / acetate, and put it back. this peacoat, however, checks off the right boxes in fit, tailoring, and fabric quality. it's made of a warm and straightforward 75% wool / 25% polyamide with a viscose lining. i'm wearing the S, as i wanted to have a bit of room for layering a sweater. perfect if you're in love with the idea of a timeless peacoat, but want to stay under $200. longtime readers know my love of gentlewomanly footwear (as evidenced here and here). these frye penny loafers are my favorite bargain buys of the season – sturdy, all-leather construction, and comfy right out of the box. they run true to size/width (i took my usual 6.5), and accomplish the feat of staying true to the old-school style without looking too masculine. highly, highly recommend them, especially as they're currently on sale in a number of colors and the full range of sizes. P.S. : per a reader's question, mine are the charcoal color – a dimensional, very dark grey that looks black. do you have a fall uniform / a favorite purchase from zara? what's your go-to shoe these days? I have a Zara pea coat (it's a little more tailored at the waist than a traditional pea coat, but that's part of what I love about it) from a few years back that I absolutely love. Every year I tell myself if I find the perfect coat I can splurge on it, but I haven't yet, and so Zara is a great stand-in for now. As you say, some of their coats are horribly acrylic, but some are quiet woolen and honestly mine has held up super well over the years. You look great in your fall staples, totally casual comfortable chic, and put together without being fussy. Pretty much how we all want to look I think! Oh and, as always, I'm a wee bit jealous of your PS1. thanks N :) the ps1 is still going strong now at the 1 year+ mark. and yes this peacoat is definitely one of the best from zara's fall line this year. You look great, this is a casual chic look I've also found to be easy to wear. Finally I found a black peacoat to go with my navy. Thanks for the review and if this peacoat came in grey I would have tried it in a flash. My favourite Zara pieces are 3 pairs of trousers I scored in their Summer sale last year. I never thought they'd last this long and serve me equally well at home, in the desert and climbing a mountain without splitting! thanks! i got a pair of slouchy printed zara trousers at the summer sales as well, just perfect for my spain travels! 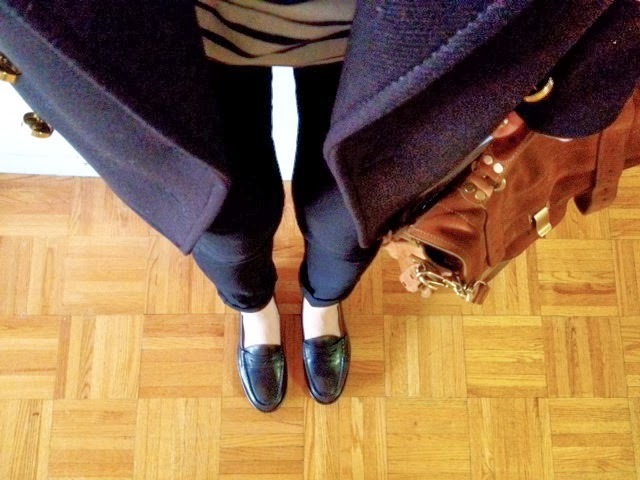 I have two pairs of similar Cole Haan loafers that I love. Thinking about getting a black pair but worried about whether they'll look too harsh/heavy with anything other than pants (I have skinny legs so am susceptible to looking off-balance with heavy shoes). Have you worn yours with a skirt? i haven't as i don't really have many skirts, and it's a bit cold now for that. but at least for my fryes the shape of the shoe is rather feminine, so i have a feeling it wouldn't look elegant either way. I had my eye on this Zara coat. I bought their olive military coat last year and it has served me well. And for the price of this coat, it can't be beat. indeed! when they get it right it's sometimes quite brilliant. Beautiful, classic outfit. Are you actually wearing the St. James Unisex Meridien II? How is the sizing? I am trying to determine if I should get the XS or the XXS. Also, have you found these hold up to washing well - any pilling? Thanks! hi - yes, and actually all my SJ shirts are the men's / unisex styles. i prefer the slouchier / longer fit and generally get the XS. my SJ shirts have held up beautifully with no pilling, but i like to hang dry instead of throwing them in the dryer (i accidentally shrank one of my old women's SJ shirts years ago!). I do have a fall uniform. If I don't have meetings or am just casual, I usually wear rolled up jeans, flats, a silk blouse, one of my necklaces, and my old Mayle Olympe wool coat. If I have to go to a meeting, I wear a silk dress (often an old Mayle dress again), tights, my black Mars boots, and my Olympe coat. I've never bought anything from Zara, which is surprising since I now live so close to one. I was hoping to find a cheaper alternative to an Isabel Marant-esque coat there, but I haven't found one i'm satisfied with. So I may just have to buy the real thing. i remember when everyone raved about mayle's coats, but it wasn't within my budget then, and then she closed her line. i try to balance buying less expensive versions with a nice splurge (one of my favorite coats is old banana republic). you'll know when you find it, i think! Actually, if I think about it: my uniform is usually old Jane Mayle pieces. Her dresses and coats are so beautifully constructed that I just feel happy when I wear them. But as it's a defunct line, my choices are limited. Ah this is the perfect Fall outfit! I always struggle in the colder months, as I never know what to wear, and working in a relatively corporate environment I feel there's a need to dress up. I'm usually in a knit sweater, some sort of skirt, and some chelsea boots or heels. you look freaking incredible!!! i can't think of a better way to dress for fall. That coat is a great find - I actually prefer its collar to the EF version, more elegant and timeless. And I love the gold buttons. My only concern would be the quality of the wool - usually a bit hit and miss with fast fashion stores. thanks ammu :) as for the wool on the zara - i did inspect it quite closely on the rack and in the dressing room to see if it wrinkled easily, but it has a nice midweight heft to it, and keeps its tailored shape well. i have a good feeling about this one! You look lovely and very comfy. I'm a bit surprised to see the Frye loafers - have you gotten rid of your Church loafers or do you just have several pairs of black loafers? I've been thinking of getting a pair Church loafers and hoping they are comfortable enough to warrant the price (relying partly on your previous review) so I'm curious if you ended up getting rid of them for some reason. see my review - it runs true to size, i could have gone with the XS if i wanted a more tailored, blazer-like fit. One more question: Do you find these Saint James shirts work for layering? As in, do you ever wear anything underneath for cooler weather, a button-down, for instance? Just wondering if it works well for that. Coat weather envy. It was sweltering this morning before turning into a mega thunderstorm. The joys of the tropics. But then at least we're not getting city-destroying typhoons (like in the Philippines right now). You look great...the coat seems just right for your proportions! thanks lin - i really like that it's slim and tailored in the right places - it drapes and holds its shape quite nicely. I love that outfit. I need black jeans - how have I gone so long without them? I adore loafers but I've spent the last year trying to break in a pair and I've been scared away from them. Great post! My favorite Zara purchase of the moment would definitely have to be their 'lingerie style dress.' It's perfectly effortless yet somewhat daring. Been returning to the vintage military coat and Coclico booties, I guess I just have a thing with big pockets that I can shove everything in. The trench has yet to see the light except when it rains like crazy. The loafer look looks great on you! I get cold very easily so I probably cannot show ankle in the winter, but the look is nice. Ooh, the coat looks great on you. How tall are you? This coat looks gorgeous on you. The drape and proportions look perfect on you. So effortless. I've never purchased anything from Zara, but I have found that fast fashion stores can source quality wool for outerwear. The problem tends to be that fast fashion coats don't hold their shape way and sag and droop after a bit of wear. It looks like this coat is holding it's shape really well.